Every star has a story but some are more curious than others. The star Arcturus has an electrifying story with a mysterious twist involving the 1933 World’s Fair. If you step out on a clear night in mid-March and follow the curve of the Big Dipper’s handle toward the eastern horizon, you’ll come face to face with Arcturus, the 4th brightest star in the sky. Pale orange and fluttering in the low air like a candle in the breeze, Arcturus is a bellwether of spring. By late May it shines high in the south at the onset of night. For the moment, the star hunkers down in the east, sparking through tree branches and over neighborhood rooftops. The name Arcturus comes from the ancient Greek word “arktos” for bear and means “Bear Watcher”. That’s easy to remember because he follows Ursa Major the Great Bear, the brightest part of which is the Big Dipper, across the spring sky. Arcturus is 37 light years from Earth and classified as an orange giant star. It spans 25 times the sun’s diameter and shines 113 times more brightly. It was another spring 80 years ago on May 27,1933, that the city of Chicago opened its Century of Progress Exposition as part of the World’s Fair highlighting progress in science and industry. 40 years prior in 1893 the city had hosted its first big fair, the World’s Columbian Exposition. In the early 1930s astronomers estimated Arcturus’ distance at 40 light years. Edwin Frost, retired director of the Yerkes Observatory in Williams Bay, Wis., home to the world’s largest refracting telescope, hit upon the idea of using Arcturus to symbolically link both great fairs which were separated by a span of 40 years. At the time, the photocell, a device that produces an electric current when exposed to light, was all the rage. Clever entrepreneurs had figured out how to take advantage of light’s ability to knock electrons loose from atoms to open doors and count shoppers automatically. They’re still in wide use today from burglar alarms to toilets that magically flush when you step away. Technological innovation through scientific progress was the theme of the 1933 fair. What better way, thought Frost, to highlight the benefits of science and link both great events than by focusing the light of Arcturus onto a photocell and using the electric current generated to flip a switch that would turn on the lights at the fair’s opening. 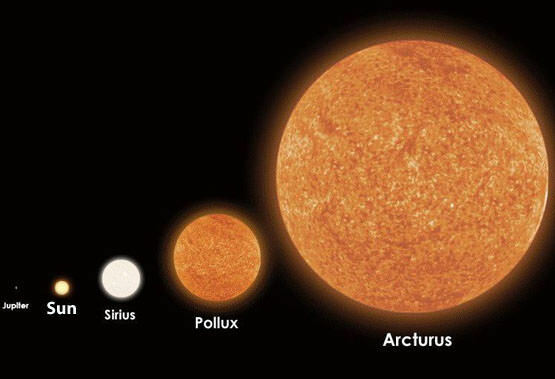 Though we now know Arcturus is 37 light years away, at the time it was thought to be about 40. The light that left the star during the first world’s fair in 1893 would arrive just in time 40 years later to open the next. Arcturus was not only at the right distance but bright and easy to see during May at the fair’s opening. Could a more perfect marriage of poetry and science ever be arranged? Although Yerkes Observatory was picked for the job, backups were needed in the event of cloudy skies. In the end, telescopes at the University of Illinois Observatory in Urbana, Harvard College Observatory and Allegheny Observatory in Pittsburgh all participated in the grand event. “We recall the great Columbian Exposition of 1893. Never will its beauty be surpassed. Above the speaker’s platform hung a large illuminated panel, the bottom half of which displayed a map of the eastern U.S. with the locations of the four observatories. The top half contained the instruments that completed the circuit from Arcturus to a searchlight in the Hall of Science. At 9:15 p.m. each of the four observatories borrowed bits of Arcturus’ light, focused them onto their respective photocells and sent the electric current by Western Union telegraph lines to the Chicago fairgrounds. A red glow ran across the map from Cambridge to Chicago. The crowd went bananas. It was such a huge hit, nearby Elgin Observatory was pressed into operation to light the fair in similar fashion every night for the remainder of the season. Harnessing a distant star for mankind’s benefit. We marvel at the 1933 fair promoters and astronomers for conceiving of this most ingenious way of linking past and present. That would be the end of a wonderful story if it wasn’t for one Ralph Mansfield. Mansfield, a student at the time at the University of Chicago, worked as a guide at Chicago’s Alder Planetarium, which was also involved in the lighting ceremony. Before passing away in 2007, Mansfield shared the story of how he was the one to point the telescope at Arcturus and fire up the fairground lights. I learned this while reading an article by Nathan B. Myron, PhD on the topic in which Mansfield sought to set the record straight. In his version, then-director of the Adler Planetarium, Philip Fox. was apprehensive about cloudy skies, so he arranged for Mansfield to set up a telescope in the balcony of the Hall of Science. As Fox delivered opening remarks, Mansfield used the Dipper’s Handle to find Arcturus in a lucky break in the clouds, and at the key moment, fed its light to the photocell. The spotlight fired up and the day was saved. So which is the true story? Most historical accounts indicate that four observatories participated, but Mansfield’s story remains. Will the real version please stand up? Thanks for the extended account of this event. It must have been amazing at the time; and it sounds amazing, to some extent, even now. I had only recently (as in the last week or so) come across this event, when it was mentioned in an old episode of the BBC Comedy Panel show QI. Great post and nice images. There is an audio of the opening ceremony online at http://www.gulbangi.com/Philip.htm. In addition, there is more on the University of Illinois Observatory website: observatory.astro.illinois.edu and Facebook page: https://www.facebook.com/U.of.Illinois.Observatory .